Larry Lemon - Mowbray & Son, Inc.
Larry Lemon is a native of Minot, ND. He attended Bismarck State College for HVAC after his high school graduation. He has been a member of the Sheet Metal Workers Local 10 for almost 40 years. Early in his career, he worked for various contracting companies in Minot, the state of North Dakota and also in other states. Larry Lemon began his career with M & S Sheet Metal, Inc on October 31, 1983. He was originally hired to work for just a few weeks which then became months… and then became years. 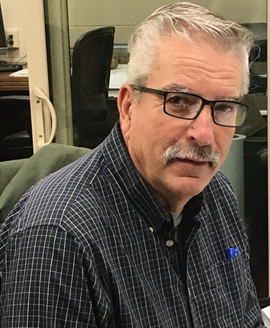 Larry has been employed with M & S Sheet Metal, Inc for 35 years as he worked as a sheet metal journeyman, sheet metal foreman, and is currently the company’s sheet metal superintendent. Larry is well respected by his fellow staff members, customers, general contractors, and vendors. His years of experience make him valuable to the job-site work but also in estimating and troubleshooting. Larry also encourages the younger generation to become part of the sheet metal trade.